Whether you are into DIY or looking for a camera system with professional installation, it is worth the trip to our Naperville location to look at your options when it comes to security cameras. Our AVM (Advanced Video Management) DVR, NVR and HDVR platforms will allow you to protect your home and business like never before. These systems offer industry-leading playback capabilities, allowing you to see everything that happened in a day in a matter of seconds. You really need to see this in action before purchasing or servicing your security cameras. 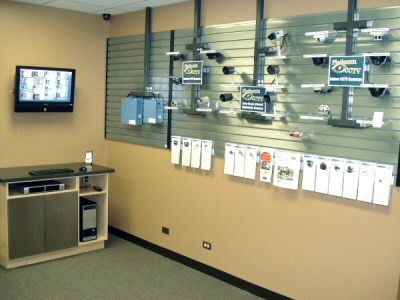 We know, Warrenville can be a hike from Chicago, however we have a showroom like no other, where you can touch, sample and experience the difference our security camera systems can offer. Security for your building is a big decision, and you want to make the right choice. That is why our professionals are here to guide you, not with their words, but by showing you the difference. Compare HD IP Cameras alongside HD-SDI and Analog types, providing you with an easier way to make a solid decision for your home or business surveillance..
At Platinum CCTV, we also can provide you with a full level of on-site service, repair and maintenance for your existing security camera system, or even connect you with installation services for systems of all sizes, both residential and commercial. Call us today at (866) 537-5438 and set up an appointment, we will come out to you and assist you in your security needs. We work with all types of CCTV, HD-SDI and HD IP security cameras.